The rugged landscape of Big Sky Country is inspiration for creative timber frame homes. Whether you’re building in the northeast flat lands, the Bitterroot Mountains, or anywhere in between, Riverbend’s Total Home Solution™ will guide you through the design process to bring you the timber frame home that suits your Montana site, style, and budget. If you are having trouble deciding on a timber frame style that will fit your family best, browse through our custom floor plan gallery – there are plenty of concepts that will inspire your very own home design. The look and feel of a traditional timber frame home fits right into the unique landscapes found within the state of Montana. If you haven’t yet decided where to build, here are some of our favorite locations. Billings is where Montana Territory began, and where your historical and cultural passport to the legendary west begins. Imagine experiencing all that Billings has to offer from the warmth of your Riverbend timber frame home. 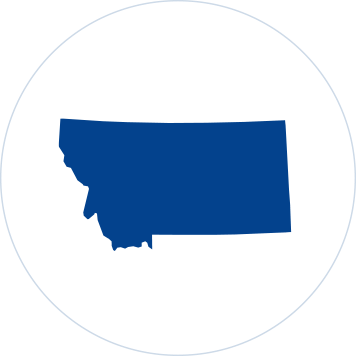 Known as the “Garden City” for its dense trees and lush green landscape, Missoula is located in the heart of the northern Rockies and serves as a center for Montana education, medicine, and the arts. With its three rivers and mountain views in all directions, Missoula is an ideal setting for your custom timber frame home. The scenic community of Big Sky nestles high in mountain meadows surrounded by timberland, the Spanish Peaks Primitive Area, and the Gallatin National Forest. Choose a site for your timber home that offers views of Lone Mountain, a quick commute for skiing at the Big Sky Resort, and ready access to Yellowstone National Park. Great Falls is located on the Missouri River among five waterfalls and grand vistas in every direction. With mountains and buttes on three sides of the city and vast plains to the north, your home is within minutes of a beautiful winding river gorge or a picturesque valley. There may be no better place for your Montana timber home than Whitefish. Located in the breathtaking Northern Rockies and adjacent to the peaks of Glacier National Park and Whitefish Mountain Resort, the town of Whitefish is also surrounded by hundreds of lakes and scenic rivers. The location of the valley keeps Whitefish safe from extreme climate changes, too, making it ideal for year-round recreation.